Fact #4. Collecting 40% of tax arrears would eliminate the 2011 budget deficit. Weak tax collection forms a big part of Greece’s fiscal problem. In June 2011, the Ministry of Finance reported that tax arrears amounted to €41 bn. Of that number, 90% came from 6,500 people and from 8,200 corporations that owe over €150,000 each. Collecting those arrears would more than cover the projected 2011 budget deficit of less than €17 bn. Fact #5. Employees in state-owned enterprises (SOEs) earn twice as much as employees in the private sector. One of the recurring themes in Greece’s political economy is the dichotomy between an insulated and well-paid public sector and a low-paid (at least for employees) private sector. According to data released by the ministry of finance, employees at SOEs earned, on average, €38,287 in 2008 – which is twice as high as the €19,147 earned in the private sector. For some SOEs, the gap was much higher. Fact #6. Greeks are as likely to pay a bribe as Nigerians and Pakistanis. According to Transparency International, 18% of households in Greece reported paying a bribe in the last twelve months, versus an average 5% in Europe. That number puts Greece on par with Nigeria and Pakistan. Fact #7. When you add private debt, Greece’s overall indebtedness is low in Europe. Everyone knows that Greece’s problem is debt. But it is, in fact, public debt that is the problem. A graph shown in a presentation by the former minister of finance adds public and private debt – when the two are combined, it is clear that Greece is at the low end of the spectrum. 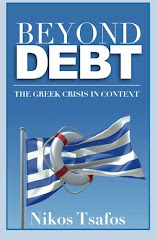 What distinguishes Greece is not high debt overall, but high government debt. Fact #8. Greece’s debt was mostly accumulated in the 1980s and early 1990s. Greek society has yet to have a serious debate about how it got into this mess. What is amazing is to see just how recent this debt accumulation is: in 1980, Greece’s public debt was merely 22% of GDP; by 1993, it was 98% where it stayed (plus or minus) for over a decade before going higher in this crisis. In other words, Greece’s debt problem was mostly created over a 13-year period and it was perpetuated thereafter. Fact #9: Greece had a relatively small state in 1980. Analysts with an eye to history will always point out that the Greek state has been omnipresent in Greek life since its inception. Yet that fact, while true, disguises the extent to which statism is a post 1980 phenomenon. In 1980, government spending amounted to 24% of GDP; by 1990, that number had risen to 45%. It kept rising, somewhat more modestly to 51% in 2009. The Greek government aims to bring that number back to 45% by 2015. Fact #10. Greece’s relative standard of living dropped after 1980. In 1978, as Greece was about to join the European Economic Community, its per capita GDP was just 5% below the European average (on a PPP basis). In 2000, the gap was 30%. In retrospect, Greece’s entry into the EEC has been seen as a political gesture, and in many ways it was; but the gap between Greece and Europe was much narrower at the point of entry than ever since. Greece was close to Europe when it joined the EEC; it was only later that Greek living standards stagnated and fell relative to the rest of Europe. Europe moved on and Greece was left behind. I read your post with great interest and alacrity. I agree with many of your points about the Greek economy, since I think that you will agree, that most of them are common sense for those living in Greece. I think we were aware that our country was not the bustling economy that government statistics claimed it was and that there were deep-rooted institutional imperfections which could not support great economic and social prosperity. However, I want to question your points comparing current development and exports with the previous years, particularly with the year 2000. As has been revealed, most of the statistics presented by the Greek governmnet concerning exports, tax revenue, debt, and deficit were false and distorted. Consequently, I do not know if we indeed had the exports that you claim we had in 2000. It may well have been that exports back then were as minimal or slightly higher than they are today, but they were inflated by government magicians! I would like to hear your opinion on this: Should we use past statistics on Greece as a yardstick for our current economic decadence, given that they have proven to be highly unreliable? You ask a big question and one that I have struggled with many times. Here is my thinking. No doubt Greek data have been unreliable. Do I think every number I quote is generated based on best practices? No. But do I think that the numbers represent broad trends more or less accurately? Yes, I do. Ironically, the revisions in the data give me more comfort in the historical numbers – I presume that, once revised, the numbers are closer to the truth. In the end, I am looking for ballpark figures – I never mean for mathematical precision (e.g. drop by 27%) to be confused for statistical precision. That brings me to a second point: in my mind, statistics should supplement other observation and analysis. If the data shows something highly counter-intuitive, odds are the data might be wrong, and it is worth taking another look. In Greece's case there is some data that is so, but most other numbers point to trends that are, as you say, common sense to anyone familiar with Greece. It is easier to believe that data, and I do. At a more fundamental level is a personal attitude towards data. Not only do I believe that a close study of data yields surprising insights, but I am also troubled by people who will use the excuse of imperfect data to never embark on the analytical journey to begin with. Better to use data while cautious of its limitations than to avoid data altogether lest a number turns out to be less than 100% accurate. That, in the end, is my guiding principle. Greece has tens of thousands of illegal immigrants who mostly work in a cash economy and send euros abroad. The latest figures from the Bank of Greece states that from 2003-2011 2.2 billion euros went to Albania, 2 billion euros to Pakistan and 200.000 euros to Afghanistan. All these people are mostly non Greek citizens from non EU countries. When you have an unemployment rate of 17% and 40% for 15-25 year olds Greece needs to deport them and put Greeks first in jobs and fine employers who hire illegals. Except that, Anon, even if you remove every last illegal immigrant from Greece you'd still have 40% youth unemployment. You'd also have Greek farmers without the labour to harvest their crops. You'd have Hotels with no cleaning staff. In the last decade, there's hasn't been a single Greek come forward to us looking for work during the olive harvest. Not one. The last time we employed a Greek to do that work was the mid 90's. Greeks are simply not offering up their labour. This is a long time ago however, when my Greek husband and I went to Crete, he was looking to work during the olive harvest. Not one farmer wanted to employ him. As a foreigner, I could get a job. When he asked why, the response was 'that it was easier to employ foreigners who didn't understand the language, and therefore wouldn't ask for higher wages and be less trouble. Bad attitude! Good selection of interesting facts! An analysis of how much real wages have increased in Greece vs the major Eurozone economies since 2000, and how the real wage increase corresponds with the decline in tourism and shipping industry would be most interesting. Clearly, it seems rather apparent that wage inflation has deteriorated Greece's terms of trade, and made it unattractive as a tourist destination and ship building hub. I strongly dis-agree with the person who thinks the solution is to deport illegal immigrants - these are people working below (a too high) minimum wage, allowing the economy to stay productive in spite of structural rigidities. Without them, Greece would be in an even bigger mess. What are the sources of these facts? Thanks! Each fact has a hyperlink to the underlying story where I discuss it in more detail. You can read my sources in the individual posts. Wow What a great Blog. I have not found a blog with such precise and understandable analysis. The Greek economy is obveously the week link of an over valued economy! From 1920-29, the Dow quadrupled, the cost of living tripled, plunging the economy into the great depression! From 1995-2007 the Dow nearly quadrupled, the cost of living tripled, plunging the economy into the great ressesion! Bailing out Wall Street preventing it from bottoming out actually cuased more harm than good! But then hey, who in their write mind would listen to me, I'm just a carpenter? Fact #11 "Greece has the highest productivity level among the eurozone members!" excellent work my friend, this post should be distributed in Omonoia sq.! From what you say, it seems tempting to conclude that the bloated state disease has been inoculated to Greece by its EU membership, and that Europe is the cause of its falling standards of living. By the way, I find it difficult to believe that in 1978, the GDP per head was only 5 % below the European average. Unless a significant part of that GDP (shipping revenues ?) was nowhere to be seen for the ordinary Greek person.